Research proves that when students don't keep their minds sharp over summer vacation, they take a month or more to get back into the swing of productive learning when school starts again. Our Unique Math Summer Enrichment Program will put your child ahead of the class even before school starts. We'll solidify their basics in math by going over their weaknesses and getting an overview of the next years math curriculum.Your child will have a better understanding of the next years math program and will feel a lot more confident at the start of the new school year. Under the guidance of our qualified instructors, your child will blossom with individual attention. Our summer enrichment program produce confident learners ready to face the classroom in the fall. They get better grades and develop a love for learning math! Kids who stay mentally active during the summer, start school prepared to learn. They're often ahead of the rest of their classmates. By attending the MEC Summer Program, your child will head back to school motivated, confident, and ready to learn from day one. The MEC has a very high success rate with students that follow this program. 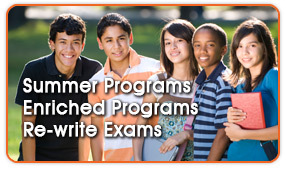 Summer Programs are offered for elementary and High school students from all levels. This Program is offered in French or in English. You can also register your child for an evaluation, which pint points your child's weaknesses areas. This allows us to design a program ideally suited to your child. To schedule for an Evaluation Exam please contact the MEC to speak with a Math Program Specialist.